From October 2016 – July 2017, the National Association of Counties (NACo) and the National Association of Development Organizations Research Foundation (NADO RF) partnered with the Appalachian Regional Commission (ARC) to continue providing mentoring and technical assistance to eleven multi-disciplinary community teams from across Appalachia as they accelerated their efforts to diversify their traditionally coal-reliant economies. This targeted initiative empowered and assisted county officials, regional development organizations, and their local partners in further developing opportunities for economic diversification, job creation, workforce development, and asset-based economic development. Specifically, this effort provided support to these teams in identifying implementable projects and strategies to form competitive proposals for funding under the POWER Initiative, as well as other sources of investment. 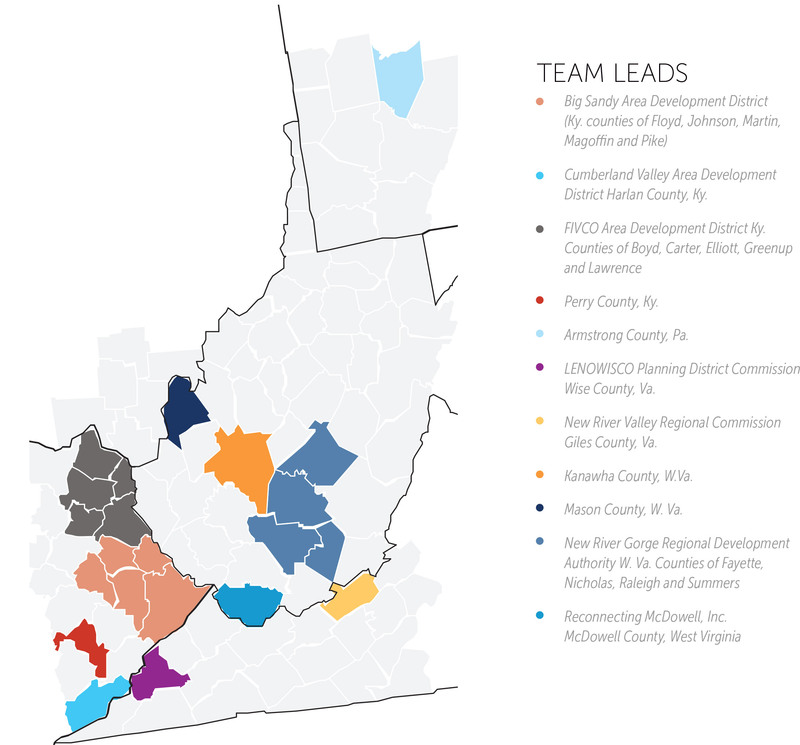 These eleven teams – representing 22 counties across Kentucky, Pennsylvania, Virginia and West Virginia – were first formed in 2015 through their participation in NACo and NADO RF’s Coal-Reliant Communities Innovation Challenge, funded by the U.S. Economic Development Administration. County and regional leaders were asked to create teams to apply for the program to gain access to resources and experts that could assist them in retooling their coal-reliant economies in order to become more resilient to changing industry conditions. Teams that submitted winning applications were selected to attend one of three intensive, hands-on workshops guided by expert facilitators, coaches and practitioners. During the course of these workshops – and those that followed as a result of grant funding from ARC – counties and regions designed solutions tailored to their communities’ needs and identified actionable projects that could showcase the innovative potential of coal-reliant communities. While the decline in coal employment in Appalachia has been an ongoing challenge for nearly two decades, these trends became even more pronounced in recent years as Appalachian counties experienced a loss of 23,000 coal jobs from 2011-2015[ii]. These declines were even more staggering in the 22 counties of this project area, as coal employment dropped nearly 50% during this same timeframe. [iii] The decline in the coal industry has also affected ancillary industries, retailers, and other businesses that were dependent on the coal industry and its workers for their businesses. Furthermore, declining coal shipments also generate lower tax revenues, leading to major shortfalls in funding for municipal needs, infrastructure, and schools. As a result of these new economic realities, local leaders have been tasked with retraining displaced workers and developing new economic engines. Simultaneously, they have had had to cope with a complex mix of social, environmental and economic concerns – including talent retention and development, environmental contamination, and health care – that greatly complicate their ability to help affected workers, businesses, and local residents. According to the 2014 Economic Diversity in Appalachia report and tool, more than two-thirds of the counties in this project area scored “Below Average” or “Low” in the economic diversification level scale for employment diversity[iv]. They are heavily reliant on resource extraction, with few other local economic drivers. Without alternative employment options, the decline of the coal industry in these 22 counties has resulted in high unemployment levels and population loss. For many coal communities, especially in Appalachia, coal industry jobs were the last “good” local jobs. Nationally, the average annual wage for US coal miners is about $82,000[v]. In West Virginia, average coal mining salaries are nearly $85,000, more than twice the statewide salary average of $39,519[vi]. So, as coal miners have been displaced, their prospects of finding comparable work at comparable pay have been miniscule. The development of the coal industry has occurred over a period of more than 150 years. As such, recovery and rebirth are not occurring overnight. The economic transition has been and continues to be painful. Yet rays of hope are also emerging. Fortunately, economic developers and community leaders in Appalachia are developing innovative new approaches that are relevant for any region in the midst of economic transformations. New paths to prosperity are being created, but the process takes time and long-term commitment. This summary report highlights how a sample of Appalachian communities are progressing in implementing their economic diversification plans after receiving tailored technical assistance from NACo and NADO RF. Addressing larger structural challenges facing their communities. Develop a county-wide strategic economic development plan that focuses on workforce development, infrastructure improvement and community reinvestment. Received a $50,000 POWER Planning grant via the Armstrong County Industrial Development Council to develop a Comprehensive Economic Development Plan/Strategy to explore sector opportunities and redesign the county’s economic development services and programs. The plan will look at new and existing services, programs and initiatives. Planning the creation of a “makerspace” as a shared, flexible, incubator environment that would encourage and support artisan, small, and/or niche manufacturing opportunities and activity locally. Supporting a burgeoning high-tech sector including electro-optics, advanced manufacturing and machining. This effort will build on recent successes such as Involta, LLC’s new multi-tenant data center near Freeport. Develop the necessary partnerships, framework and physical infrastructure to spur economic development. Established and staffed its first-ever Economic Development Authority and Tourism Department to pursue site planning for business park development and advanced manufacturing recruitment, in addition to promoting and cultivating natural assets such as state parks and forests. Leveraging existing partnerships, including those with the Shaping Our Appalachian Region (SOAR) regional development group and the Kentucky Highlands Investment Corporation, to plan and develop new broadband infrastructure across the county and region. Working in conjunction with the Kentucky Adventure Tourism Office to improve recreation infrastructure and establish a network of “trail towns.” Harlan County's Tri-Cities were officially designated as Kentucky Trail Towns and the three historic mining communities have been marketed as home to some of the best recreational offerings in state. Helping to create a natural resource-based manufacturing enterprise with positive environmental impact. The effort would to develop the waste typically left behind in the forest after timbering and transform it into marketable wood pellets. Coordinating with the POWER-funded Virginia Emerging Drone Industry Cluster Project in partnership with UVa-Wise and Mountain Empire Community College to support workforce efforts related to the newly offered college classes on building and operating unmanned aircrafts. The project aims to position the county and southwestern Virginia region as a national destination for the development of a drone-operator workforce. It specifically supports the retraining of former coal industry workers to operate drones and drone sensors to provide services including geospatial surveys, close-up inspections of fixed structures and mapping. Building a technology-sector strategy to attract new enterprises - including software, cyber-security and data centers - while also re-training existing workers and attracting new talent. Leveraging already established high-speed broadband to support the business case. Exploring the implementation of new energy technology strategies, such as solar and hydro pump storage. Working collaboratively through the Solar Workgroup of Southwest Virginia to create a roadmap for renewable energy economic development in the seven coalfield counties of Southwest Virginia. The effort addresses all aspects of the solar value-chain, including the identification of opportunities for specific renewable energy projects as well as workforce development needs. Leveraging and linking assets for heritage tourism, recreation and main street revitalization. The regional planning district worked to recently launch its first local ATV trail system, Spearhead Trails, marketed as a world-class riding destination with over 500 miles of ATV and Equestrian trails. The county also recently supported the downtown historic restoration and construction of the The Inn at Wise to provide additional lodging and meeting facilities as the county continues to mature. Pursue a comprehensive economic development planning process to both build on local agricultural opportunities and to explore other employment sectors. Received local funding to update its existing master plan for the Mason County Industrial Park. The 200-acre county-owned business facility is operational and employs full-time workers doing steel fabrication, but has significant room to grow and attract new clients and businesses. Selected agriculture and food systems development as its top sector of focus following an asset assessment approach which highlighted the area’s river valley flatland and deep agriculture heritage as key to sustainable growth. Continuing to work with the state and the county agricultural education office to administer Farm-to-Schools program allowing local farmers to supply their agricultural products to local schools. Developed a Farm-to-School Challenge with WVU Extension to encourage young people to become involved in growing their own food while supporting the local small farm industry and local economy. Working as part of the 40-county region served through the EDA-funded TechConnect West Virginia organization to promote the continued diversification of the region’s economy through innovations in advanced energy, chemicals, biometrics, biotechnology and advanced manufacturing. The program, known as ScaleUp West Virginia, is designed to spur innovation and entrepreneurship, long-term competitiveness and diversification and job creation across the state. Capitalize on natural assets to become an outdoor recreation destination (50 miles of the Appalachian Trail and 37 miles of the New River span Giles County) and explore adaptive reuse of former coal-fired power plant. 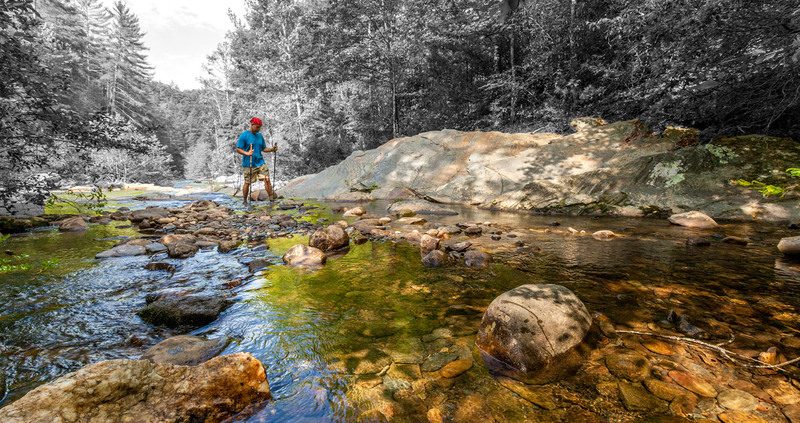 Served as a major partner of regional SWVA POWER grants to develop outdoor recreation economy across SWVA. Includes a planning effort to create a recreation destination and gateway center on the New River, in addition to three concurrent downtown revitalization projects across the county. Developed the New River Water Trail and hired full-time tourism marketing staff to generate new visitors and local spending. In addition to strengthening the tourism-based economy, focused on building and strengthening workforce around the healthcare, manufacturing, business and financial services, information technology (cybersecurity), and food and beverage processing sectors. Develop a more entrepreneurial economy in the New River Gorge Region. Directly received a nearly one-million-dollar ARC grant to establish a technical assistance support program to assist start-up businesses with hands-on technical aspects of their operation as well as to hire social enterprise and region-wide business coaches. The effort is expected to add more than 200 new small business jobs to the local economy by providing tailored technical assistance and support to new and emerging entrepreneurs throughout the region. Partnered with a multitude of organizations in 2016 to open The Hive facility, in Beckley, WVa. Serving nine counties in Southern West Virginia, the HIVE Network has established itself as a critical resource for budding and dynamic entrepreneurs of all ages and serves as a working space and incubator facility to foster entrepreneurial activity and business growth. Closely involved with the creation and implementation of the ARC-funded Sprouting Farms project to provide an incubator for agricultural entrepreneurial activity providing resource sharing, land access and farm business courses. The project is facilitating the development of a vibrant agricultural industry in a nine-county area in southern West Virginia by educating new farmers, launching farm businesses and jumpstarting wholesale market channels, all while encouraging business and farm sustainability. Worked alongside the New River Gorge Trail Association to assist in securing ARC funding to complete an economic feasibility study for a regionally-connected bike trail system in Fayette and Nicholas Counties. The focus of the study will be the viability of linking over 500 miles of bike trails and the impact to small communities throughout the region. Commissioner Matt Wender of Fayette County, W.Va., said "It's amazing what you can do as a community if you don't worry about who gets credit for it." How is Appalachia responding? How are local leaders dealing with the coal industry’s downturn? Each community and region has embraced a different mix of economic targets, but some promising ideas are already sprouting up across the Appalachian region. New approaches to tourism are especially promising, and some interesting models are emerging. Southwest Virginia’s The Crooked Road – a destination trail following key locations tied to the birth of country music – is gaining lots of attention. Other strategies also seek to link multiple destinations and activities – all as part of an approach to encourage longer visits and create more local business opportunities. A shining example is the Kentucky Trail Towns program which is connecting communities to trail systems and developing once-quiet areas as tourist destinations by guiding travelers to local trails, food, lodging, museums, entertainment and other services. In Southwest Virginia, regional leaders are hoping to position the area as a center for unmanned aerial vehicle (UAV) testing and research. In 2015, Wise, VA, was the site of the first-ever remote drone delivery of pharmaceuticals and medical supplies. More recently, regional leaders have created the Fly Wisely Accelerator Corporation to serve as a regional advocate for UAV development. In addition to its work supporting UAVs, Southwest Virginia is also touting its potential as a center for information technology firms and data centers. The region has good broadband infrastructure, ample water and a secure location. It is also home to the University of Virginia at Wise which operates Virginia’s only undergraduate software engineering program. The university has also recently inked a partnership with the Mach 37 Cyber Accelerator program to create closer linkages to the technology community in Northern Virginia. Finally, Mountain Empire Community College, based in Big Stone Gap, VA, has become the state’s first provider of credit-based courses on UAV technologies. Fortunately, displaced coal industry workers have many skills that are in high demand if appropriate transition services are in place. A recent Virginia Tech study[viii] assessed relevant workforce skills in Southwest Virginia. This analysis found that many coal industry occupations, such as roof bolters and machine operators, require STEM-related skills and competencies that directly translate to high level production positions in growing manufacturing sectors. Many successful programs are already helping miners transfer these STEM skills to new sectors. Efforts across KY, WV and PA to help miners move from “coal to code” have received loads of media attention. Bit Source, a web development firm in Pike County, Ky., has been the subject of more than a dozen national and global news stories. The success of these IT efforts is a reminder that, even though located in rural areas, many coal-impacted communities do have excellent broadband infrastructure in place. Similarly, coal workers are also well-situated to obtain new employment in the growing solar industry. A recent study[ix] found that the solar industry could conceivably absorb nearly all the workers projected to lose jobs in the coal sector. More importantly, the researchers found that technical workers could actually earn more in the solar sector. While America’s coal regions face unique circumstances, their economic adjustment challenge is quite similar to that facing other American regions in transition such as textile, paper mill, or steel communities or regions facing lower revenues from the oil and gas industries. The challenge is not just about coal; it is about making it easier for working people to pursue new careers and economic options in the face of economic dislocations. Luckily, the momentum for change at the community level is heartening. People are coming together and developing new and interesting strategies to rebuild long-neglected communities. The process of change will not be easy, but the current transition offers tremendous opportunities to rebuild communities that have suffered from decades of neglect and disinvestment. These efforts can serve as future models for how to do economic adjustment right. [i] Hodges Economic Consulting, Appalachian Coal Industry, Power Generation, and Supply Chain (Appalachian Regional Commission, 2016). [iv] University of Illinois Regional Economic Applications Laboratory; Center for Regional Economic Competitiveness, Economic Diversity in Appalachia: A Research Report and Economic Development Tool (Appalachian Regional Commission, 2014). [v] Erik R. Pages, Lessons from the Coal Industry Transition (The IEDC Economic Development Journal, 2017). [vii] NACo County Explorer, Mapping County Data. All “Snapshot” data retrieved from http://explorer.naco.org.